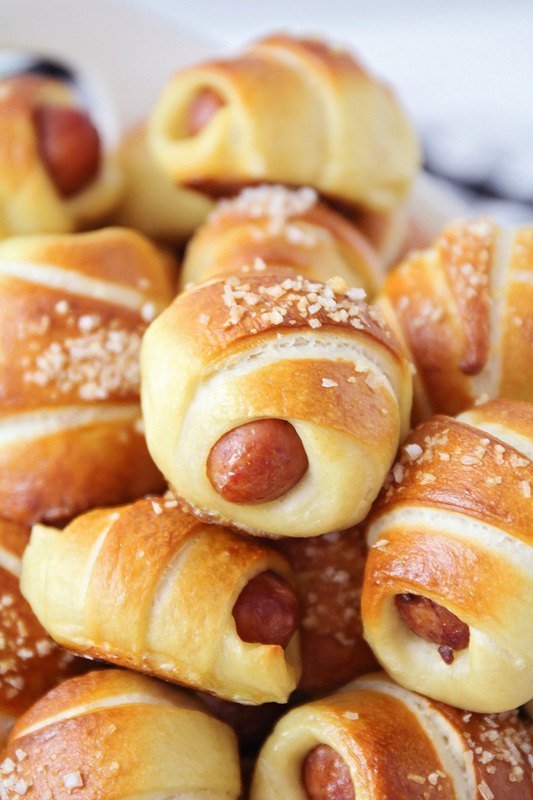 These adorable and easy to make mini pretzel dogs are the perfect appetizer! Okay, friends, who else is struggling with the time change? It's one of my least favorite times of year, and I am totally exhausted. I'm a terrible sleeper at the best of times, and any little thing that throws off my rhythm just exacerbates all of the problems I had in the first place. Every year it seems to take me several miserable weeks to adjust to the time change, and I turn into an irritable, exhausted zombie. Ugh! I do love that there's more daylight in the evenings now, and that it's starting to feel like spring. I just wish I didn't have to be so tired for several weeks in order to have more light! One of the positive things about this time of year is that I'm starting to plan out our yard and garden for this year, and I'm so excited! We bought our house last summer, and we were so focused on fixing up the interior of the house that we did basically nothing to our outdoor spaces last year. 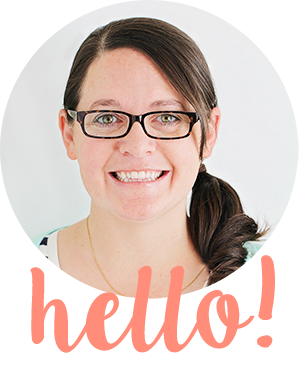 This year, I'm excited to plant a garden in our raised garden beds, and I've even got big plans to paint our deck and pergola to make the space brighter and happier. It has been a long dreary winter, and it makes me feel much more hopeful now that the days are getting longer and spring is coming! 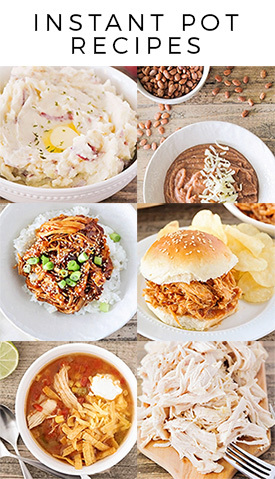 Since we're still in that in-between period where half of the days are rainy and cold and dark, and half of the days are sunny and warm, how about a delicious appetizer to cheer everyone up? 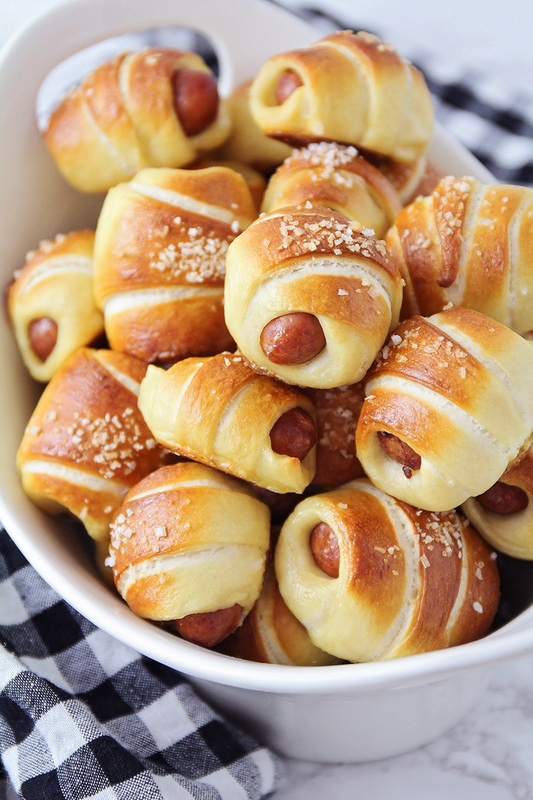 These mini pretzel dogs are so fun and adorable, and they taste amazing. 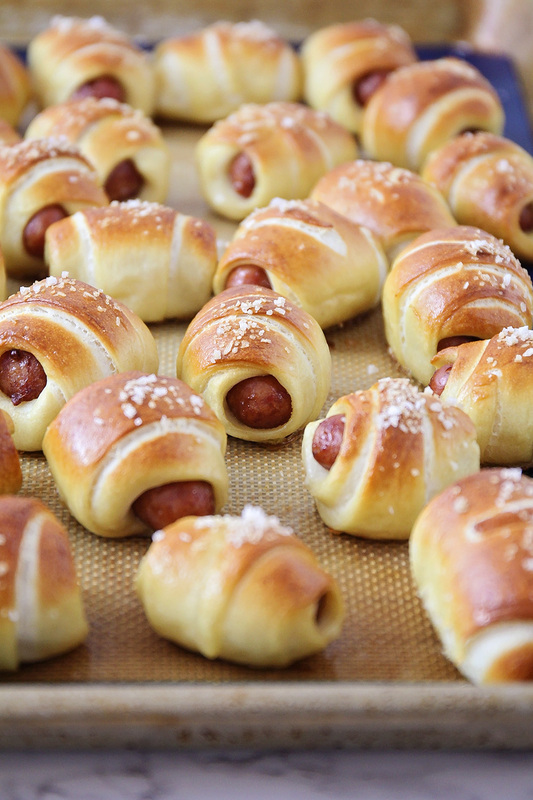 They remind me of warm summer days at the ballpark, but they're easy to make at home in the oven. They work great as an appetizer or snack, and my kids love it when I add them to their school lunches. They're totally delicious! In a large bowl or the bowl of a stand mixer, mix together the warm water and sugar. 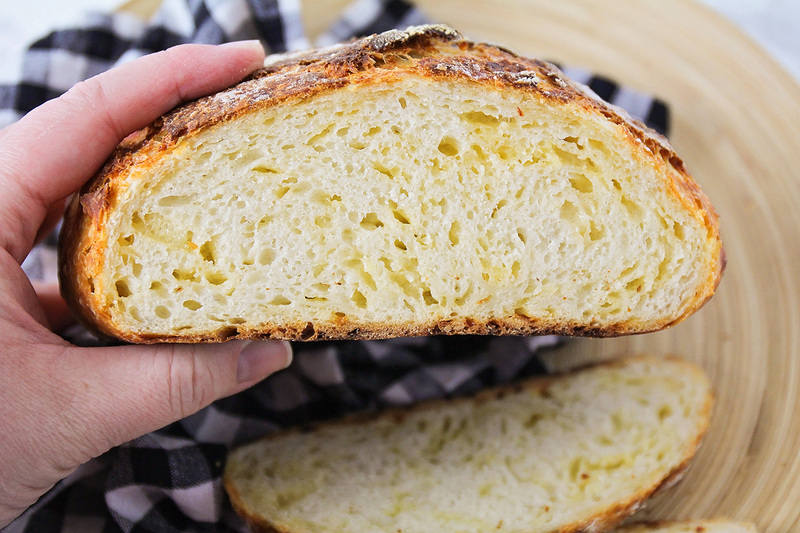 Sprinkle the yeast over the top and let stand five minutes, until foamy. Add the flour, salt, and butter, and mix until combined. 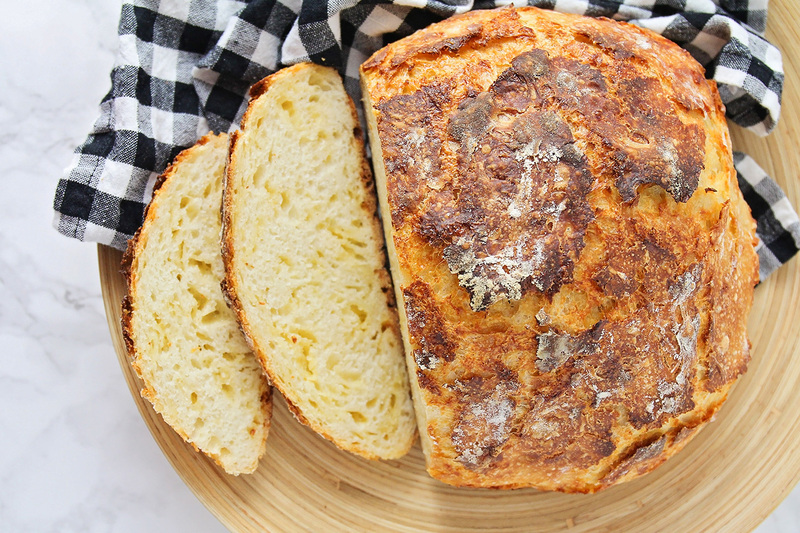 Knead 5-10 minutes, until smooth and pliable. 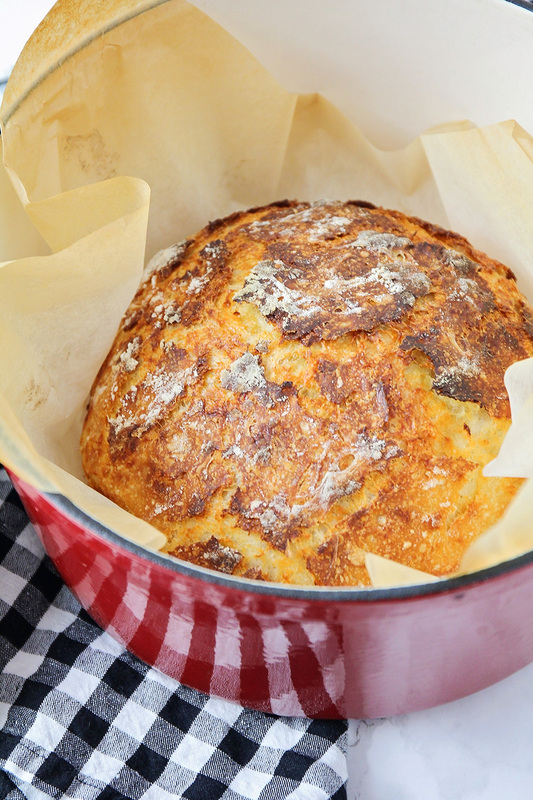 Form the dough into a ball and place in a lightly greased bowl. Cover and let rise in a warm place for 1 hour, or until doubled in size. Preheat the oven to 450. Line a large baking sheet with parchment paper or a silicone liner, and spray with cooking spray. Heat the water and baking soda to boiling. While waiting for the water to boil, gently punch down the dough and divide it into 3 equal-sized balls. Roll each ball out into a circle that is approximately 12 inches in diameter. Using a pizza cutter or sharp knife, cut each circle into twelve wedges. Place a sausage at the wide end of each wedge, and roll the dough around it, pressing with your fingers to seal the end. Place the wrapped dogs a few at a time into the boiling water for 30-60 seconds, then remove to the prepared baking sheet. Brush the top of each dog with the egg wash, then sprinkle with salt. 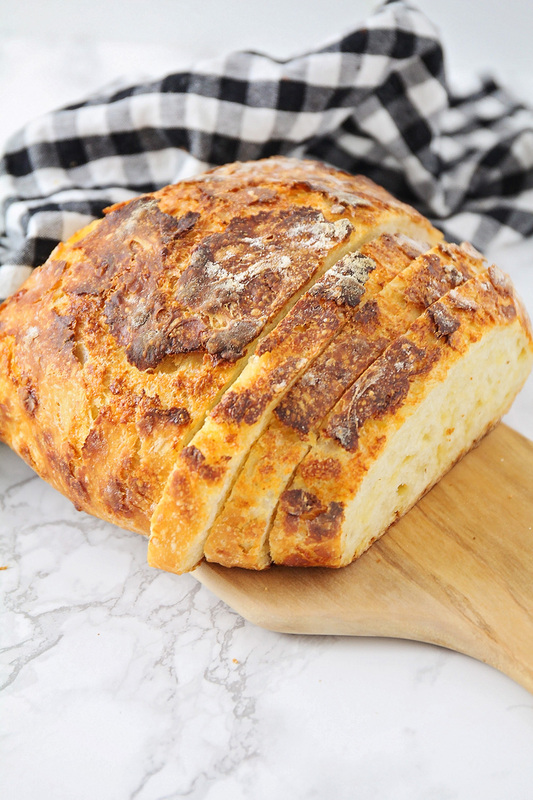 Bake 10-12 minutes, or until golden brown. Remove and let cool slightly before serving. 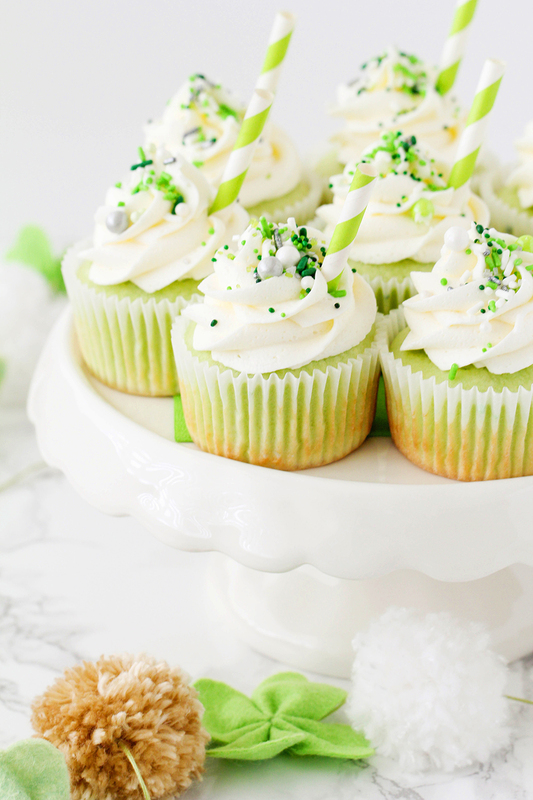 These shamrock shake cupcakes are so adorable, and perfect for St. Patrick's Day! Can you believe it's March already? We've had a few sunny days in Portland this week, after a long and dreary winter, and it finally feels like spring is on the way! This is our first spring in our new house, and it has been really fun watching the bulbs push up in my backyard over the last few weeks. The previous owner of our house was quite the gardener, and so far we've identified tulips, crocuses, and daffodils peeking up. I can't wait for warmer days, fresh air, and sunshine! St. Patrick's Day always feels like the beginning of spring to me. My family didn't do much to celebrate when I was a kid, but after I got married, my husband and I decided to make it a special (albeit low key) day every year. We always cook a fun Irish dinner together (this Guinness beef stew and split pea and bacon soup are two of our favorites), and make a delicious Irish dessert like this Irish lemon pudding or Irish apple cake. We usually buy each of our kids a new green t-shirt or dress, and if I'm feeling extra energetic, sometimes I hide some gold coins somewhere in the house and tell them a leprechaun stopped by. It's fun to add a little extra celebration to an otherwise ordinary day! 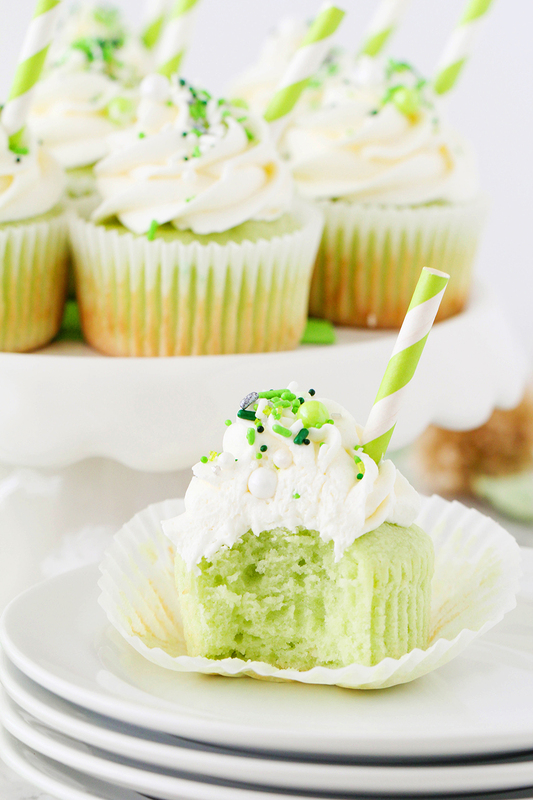 I made these shamrock shake cupcakes for our St. Patrick's Day dessert last year, and my whole family loved them! Just like their namesake, they're basically vanilla flavored, with just a hint of mint, and some green food coloring to make them festive. I used my favorite light and airy marshmallow frosting to top them, and then added some festive sprinkles and a little striped straw to make them extra adorable. They turned out so cute! Preheat the oven to 350. Line a muffin tin with paper liners. 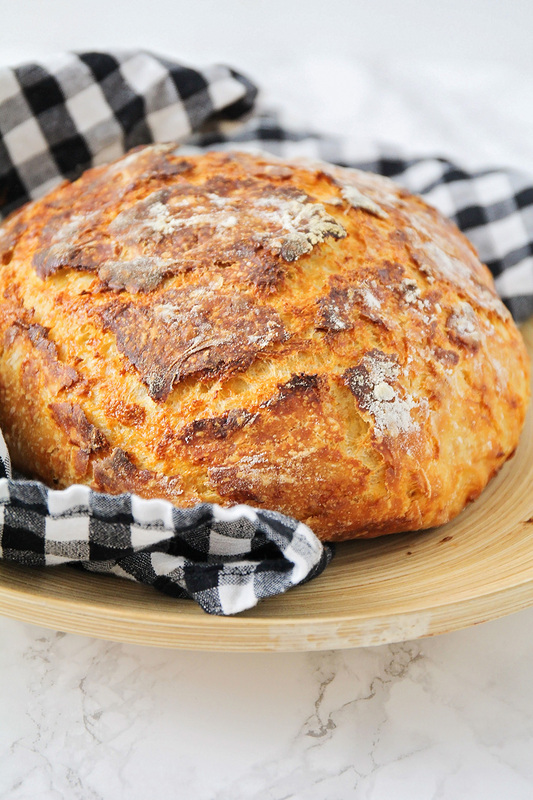 In a large bowl or a the bowl of a stand mixer, whisk together the flours, sugar, baking powder, and salt. Grate the cold butter into the bowl, and mix until the mixture resembles coarse crumbs. Add the eggs one at a time, beating well after each addition. Combine the sour cream, vanilla, and mint extract in a measuring cup, and add about half of the sour cream mixture to the flour mixture. Beat until well blended and smooth. Add the other half of the sour cream mixture, and beat until smooth. Add 4-5 drops of food coloring to turn the batter a pale green. Fill the paper liners 2/3 full and bake 20 minutes, or until a toothpick inserted into the center comes out clean. Let cool in the tin for a few minutes and then remove to a cooling rack to cool completely. To make the frosting, beat together the butter and marshmallow cream until light and fluffy. Add the powdered sugar,and vanilla, and beat until light and fluffy. Add additional powdered sugar or milk as needed to make a smooth, pipeable frosting. 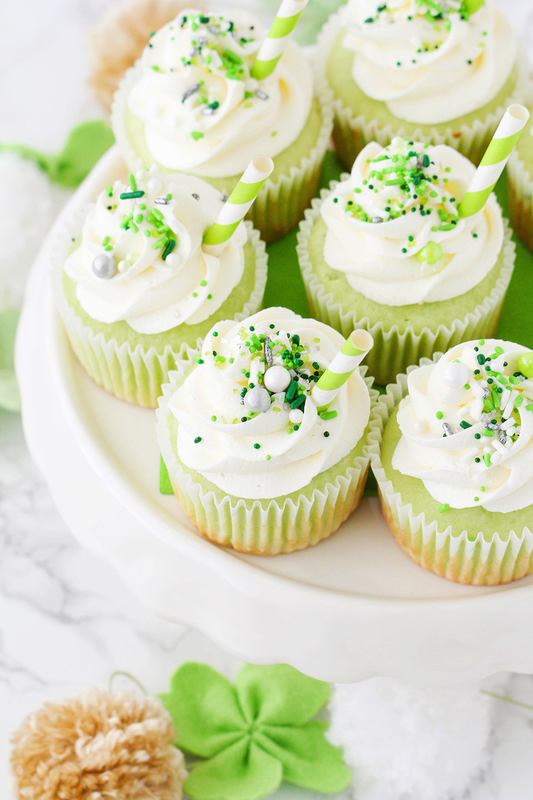 Frost cupcakes as desired and top with sprinkles. 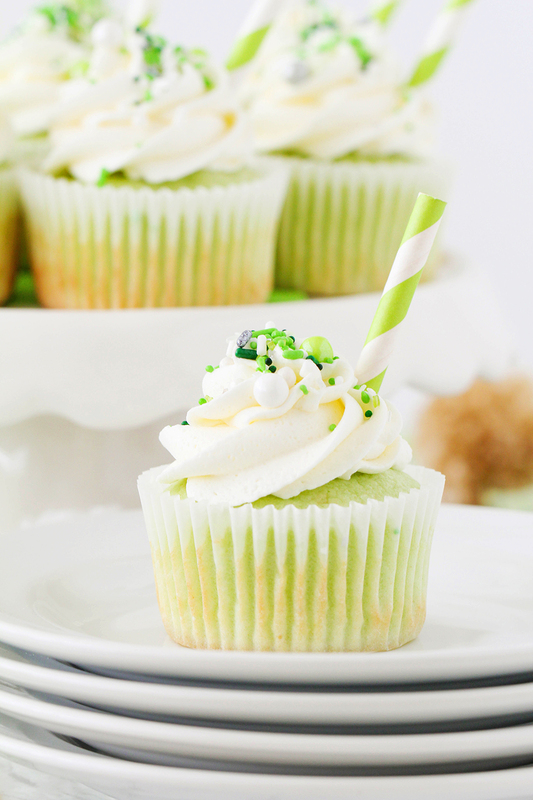 Add half of a paper straw to each cupcake for decoration.